Home Carolynne Arts and Culture Review: The Ginger Snapped, or maybe just flopped? As a Manchester native, the world of drag is no foreign thing to me, being surrounded by the lively LGBT+ scene of Canal Street. 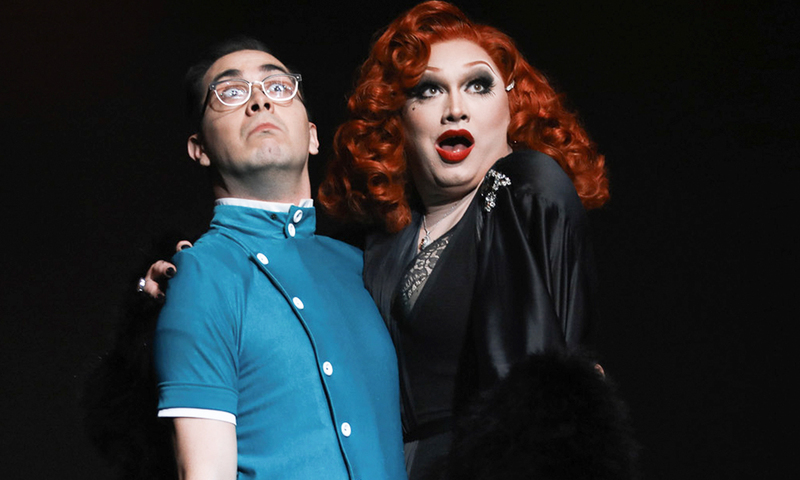 I was highly anticipating the day that Drag Race season 5 winner, Jinkx Monsoon, to take her ‘The Ginger Snapped’ tour to Lancaster’s very own Dukes Theatre. My expectations were already a little different from what I would usually expect from a drag show, given the fact this was in a theatre. The show began with a packed audience greeted by entertainer, Major Scales, who I will say did try his best with the crowd to set the tone for a night centred around a somewhat tired narrative of Monsoon as the typical ‘fabulously tragic’ diva trope full to the brim with campy quips and canned jokes. Scales was a key part of the entire show, which I have to say did not end up helping Monsoon’s efforts to pass off this performance as a groundbreaking piece of theatre. Major proved to be detrimental in many ways to the course of the show, with his role drifting between a backing musician to the main character in the show’s narrative, fluttering in and out of the audience’s attention. His performance mostly hinged on his ability to out camp the efforts of Jinkx, complete with his Rolodex of questionable one-liners and an assortment of even more cringe-inducing knee jerk movements in what I assume were attempts at physical comedy. However, his musical abilities were the highlight, and he played the keyboard very well, showing a definite talent for playing music that did not translate into his comedy. Sadly, the star of the show, Jinkx Monsoon herself, was in fact for me a bigger disappointment. While I won’t deny that she has an impeccable stage presence and a flair for theatrics, her performance was only slightly better than her stage mates. Monsoon burned through performances of songs from her latest album ‘The Ginger Snapped’, giving impressive, sometimes quite technically well-executed vocals. Beyond her musical numbers, the main nail in the coffin for this show was the lack or original comedy from Monsoon. As a queen with a reputation for being a heavyweight in the world of drag comedy, I was expecting more original jokes. Instead, she offered jokes heard before about other Ru girls (sometimes even initially from other Ru girls), mental health, and stereotypical subjects for generic campy comedy. In defence of Monsoon, for a majority of the audience, these jokes landed and to waves of laughter, but my friend and I found ourselves rolling our eyes a lot more than we found ourselves red in the face from laughing. I feel the root of the reason why I found myself losing interest rapidly in the music and comedic stylings of Monsoon was because of the incredibly worn out narrative that the show was following. The show’s narrative focused around the idea of Monsoon’s downward spiral of substance abuse, awkward sexual encounters, and envious thoughts towards other successful queens, all through therapy sessions that jumped in and out of a song in a somewhat sporadic fashion. This storyline was full of cliches and familiar tropes such as the very predictable therapist’s couch and a whole host of sections of monologue that seemed to be plucked right out of some of the many other similar shows. In all fairness, many people in the audience enjoyed Monsoon’s material, but I found the overly camp, incredibly predictable, and astoundingly tired narrative of the show was a huge let down for me. I left the theatre feeling relatively unmoved, if not somewhat irritated. The show was for sure not my cup of tea. If you enjoy old school campy drag with a few non-PC jokes thrown in, this show will be for you. I would recommend watching Monsoon if you enjoy loud noise humour and simplistic loud slapstick comedy the Ginger Snapped. I will not, however, be returning as it is acutely not my taste in comedy, music, or storyline. Previous articleShamima Begum: Villain or Victim?